Life is pretty busy at the moment, and I'm trying to squeeze in a little bit of yarn play here and there among the other, far-less appealing commitments that need to be tended to. I've found that the crocheted squares I'm doing for a blanket for Dev are the perfect little amuse-bouche at the end of a long day. I find myself whizzing through a bunch of centers, and then doing the alpaca edgings on three or four at a time - it feels very productive to all of a sudden have four new finished squares at the end of an evening! 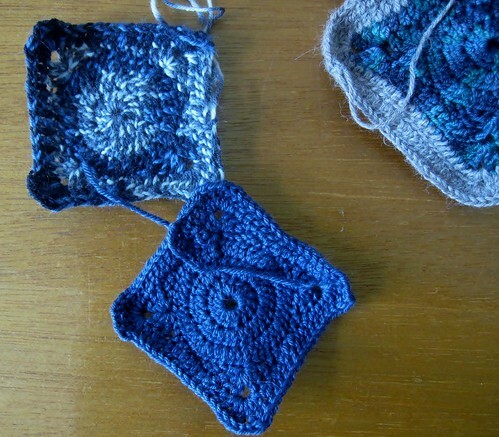 Once those two are done, I'll have 26 finished squares. 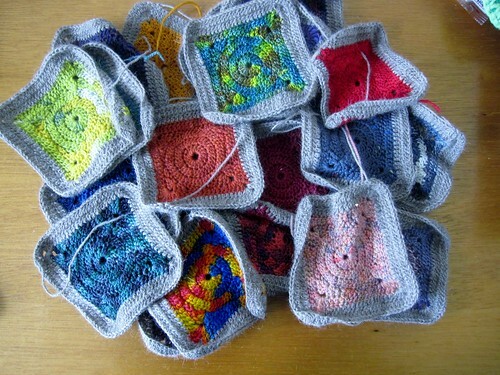 I figured out last week, however, that in order to make a more-or-less twin sized blanket, I need (gulp) 120 squares. Ouch! I'm either going to have to start buying All The Mini-Skeins, or accept that it is not likely that it will be done by Christmas. 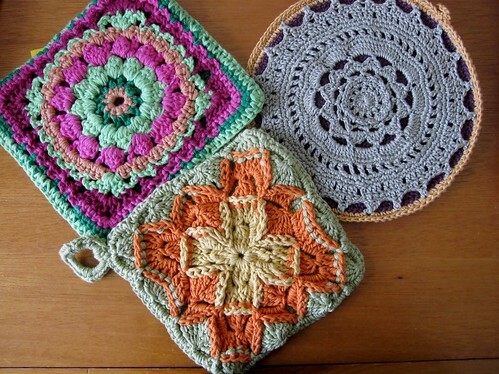 I had some other crocheted items appear in my life this past week - my new Potholders! The patterns (from top left and going clockwise) are: Fudge by Jan Eaton, DROPS Extra 0-843, and the Wool Eater Blanket by Sarah London. I love them, and plan to hang them in a place of honor in my office instead of using them - they're way too pretty! This swap was lots of fun, and I'm looking forward to taking part again next spring. Written by porpoise On May 23, 2013 In "Devil", "blanket", "crochet"